A CHILD AFTER 40 is delighted to announce the launch of a 2011 free weekly Summer Series of Guest Experts & Authors Forums on motherhood after 40 for our Members. From 14th June to 23rd August, you're invited to LOGIN and "Ask Our Expert/Author" questions about their area of expertise. A full listing of summer Forums is available in our weekly our Member's News Brief emailed direct to you. You can also check out our NEWS ARCHIVES. Remember to look out for regular Summer Product Contest & Giveaways! 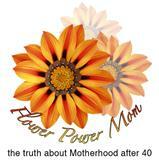 FlowerPowerMom.com—The Truth About Motherhood After 40 (http://flowerpowermom.com/), features real mom stories, expert advice and the first online community to empower all women on the journey of motherhood after 40. A Child After 40 online offers free membership and support with “Ask Our Expert” educational forums on midlife motherhood—from fertility, ART, pregnancy, birth or adoption, to parenting after 40. Join us Summer 2011!